They look like dragons and behave like any other large carnivore. They’re imported indiscriminately, with thousands sold each year. They grow quickly from charmer to liability, and outgrow any habitat smaller than a room. They are Nile monitors (Varanus niloticus). Alert and intelligent, Nile monitors’ place in herpetoculture should be at the pinnacle, in the capable hands of experienced, responsible and dedicated keepers. Large monitors, however, continue to be popular in the pet trade as highly affordable juveniles. Most Nile-owning people are unprepared for what lies ahead. You will need to know the basics of care and what to expect from adults. A cute baby Nile monitor in the pet shop tank is deceptive, for prospective owners cannot conceive of its incredibly rapid growth. For example, a leopard gecko will increase its hatching weight 20-30 times (approximately 3.5 g to 100.0 g). Nile monitors, in contrast, will grow 200-300 times birth weight (30 g to 10,000 g). Size is emphasized here because it is the single most important issue for owners of Nile monitors. Other large monitors offered in the trade, e.g., ornate (V. ornatus, formerly V. niloticus ornatus), Asian water (V. salvator), white-throat (V. albigularis) and crocodile monitors (V. salvadori, present similar problems in husbandry. 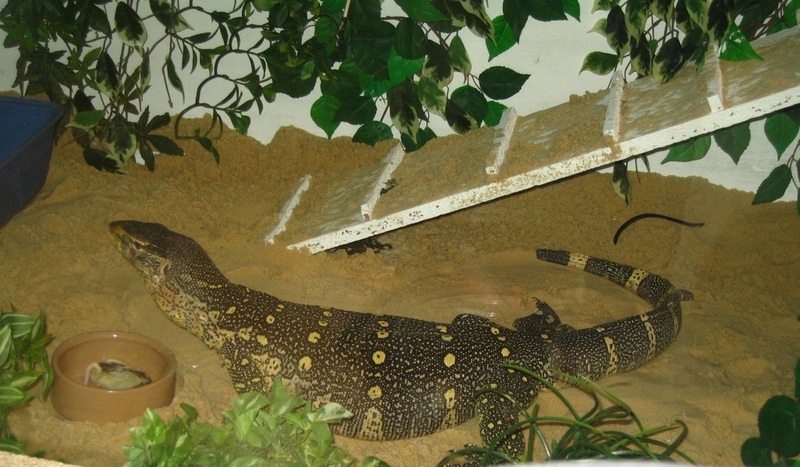 In the guidelines that follow, every aspect of husbandry addresses the large size of Nile monitors. Hatchlings can start off in tanks 3’ long with secure screen tops. After 6 months they need enclosures of at least 4’ x 2’. Adults (2-3 years old) require an enclosure the size of a small room, at least 12’ x 4’ for monitors under 48 inches in length and at least 15’ x 5’ for specimens exceeding 48”. Juvenile monitors should be provided with shelters in which they can curl their entire body. Adults should be offered plastic doghouses or the top half of large dog carriers. Many monitors use their shelter for sleep. Others will spend the night on tree branches or in their water container. Flat rocks are required for nail wear. If rocks are placed alongside the water container, nails will wear as the lizards enter and exit the water. To accommodate high levels of activity and digging, the best substrates are mixes of peat moss-based potting soil, ground fir bark and sand, with some coarser material such as a fine grade ground limestone to help wear nails. This substrate allows the digits to remain in a normal position rather than twist to the side, as found in large monitors kept on solid flooring. (Note: Dr. Horton prefers paper, carpet, or recycled newspaper). Digging may release a brown dust that will cover everything in the room. Newspaper can be used with young animals, especially prior to worming, but is unsightly and fails to provide a proper texture for adults. Extra light and heat are required for monitors of all ages. Lights should be on 12-14 hours a day. The temperature measured right under the basking site should be 88-92° F. For thermoregulation, part of the habitat should be 5-10°F cooler. As for most amphibious monitors, the Nile ’s activity temperature is relatively low, about 90° F. For juveniles, overhead spotlights are sufficient. For monitors over 30” in length, one needs combinations of large reptile heat pads and at least 2 spotlights, or 1 spotlight and 1 infrared ceramic incandescent heat bulb over one or more basking sites. These can be controlled by rheostats or thermostats. Monitors benefit from exposure to a UV-B source (e.g., ZooMed® 5.0 fluorescent bulbs) when young, and for larger animals, mercury vapor reptile UV-B bulbs. Alternatively, an area can be provided where Nile monitors can bask in unfiltered sunlight (through a welded wire screen-covered window or in an outdoor plastic-coated welded wire cage during the summer). Diets for juveniles can be 4-week-old crickets gut loaded with a multivitamin/ calcium/ vitamin D3 supplement. Nile monitors should be fed crickets daily and offered a pinkie mouse weekly. For older juveniles, king mealworms can substitute for crickets, and larger mice can be offered. However, unlike broad-snouted monitors, the narrow-snouted Nile monitor can feed only on relatively small vertebrates (with body width less than 2/3 the width of the monitor’s head). Monitors over 3 feet long will continue to enjoy king mealworms but the bulk of their diet is best filled by a carnivore diet meat mix or mice. Various zoos use a diet of lean ground turkey supplemented with calcium carbonate and a complement of vitamins and minerals. The turkey is either cooked or frozen for about a month to reduce risks of Salmonella transmission. Commercial meat-based carnivore diets can also be fed. Nile monitors should be fed every 1-2 days. Niles are almost always hungry and fare best if fed measured portions once daily, although babies can be offered as much as they will eat per feeding. For adults, I feed an amount roughly equal to the volume of the monitor’s head every 2 days. Excess food can lead to obesity in adults. Accessible water tubs large enough for complete immersion are required. For small individuals, reptile water dishes, dog bowls and plastic storage containers suffice. For adults, plastic cement mixing tubs or plastic kiddie pools are required. Nile monitors kept singly usually defecate in their water container. If kept in groups (one male and one or more females), mating attempts by males will often cause the females to defecate on the ground as a defense. Sexing is difficult in juveniles. Males may evert their hemipenes during handling or defecation. Males generally grow larger, with a proportionately more elongated head. Growth rates of females slow significantly during sexual maturity while males continue to grow rapidly for another 2 years at least. Females raised since hatching may be tame when kept in larger front-opening cages. They are generally less active than males. In contrast, males generally display a much higher level of responsiveness and curiosity, but tame less readily. If kept in cages that are too small, Nile monitors usually display behavior of being cornered, manifested by frantic flight attempts and, when these fail, holding ground and tail-whipping.